We're beginning to think that the postage for mailing off International League Championship rings is going to really add up this year. Here are a few more players who won't be back. Leslie Anderson had been released. After a fairly rough start in 2011, he was a mainstay of the Bulls in 2012 and 2013. We did not expect him back, and that’s the way it looks like it will play out. He’s had a good winter so perhaps he will look good to a Korean, Japanese or Taiwanese team. Backtracking to the middle of the month, shortstop Tim Beckham won’t be back until mid-season at the earliest. He hurt his knee working out, has been operated on, and is beginning his rehab. Pitcher J.D. Martin won’t be back at all. He signed with the the Samsung Lions (Korea). He was our favorite pitcher last year and he will be sorely missed. We’ll have to do a rant some day about how Major League Baseball could keep some great ballplayers here in the US by simply paying AAA players a bit more. Chris Gimenez got claimed off waivers by the Athletics. Apparently the Rays wanted to make some room on their 40-man and the Athletics pounced. He will be joining former Bull Stephen Vogt out there. Vogt had a decent year with the Mud Cats and the A’s last year. We liked Gimenez a lot and think that he is yet another catcher that might have been able to help the Rays more if they had let him. He was only in three games as a Bull while on on a rehab assignment, but Rays DH Luke Scott is off to Korea as well. For a short trip into the land of the bizarre, here's news of Bull Durham, the Musical. Somehow I just don't see Crash Davis breaking into song … and a duet with Annie just seems a bit odd. 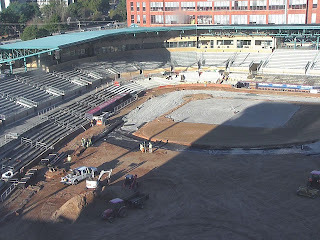 Meanwhile, they've started installing seats in the DBAP and there's only 96 days to Opening Day! 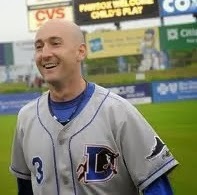 Craig Albernaz is one of WDBB's all-time favorite Durham Bulls, right up there with Chris Richard, Jon Weber, Fernando Perez, Joe Dillon, and Elliot Johnson. His numbers aren't all that spectacular, but in our section of the stands that was always attributed to his lack of playing time. And that really was a problem from our point of view. Over 5 seasons, he only got in 121 games, far fewer than many lesser catchers we've seen come through the DBAP. We thought that 2013 was going to be his year, since, other than Chris Gimenez, the Bulls were light on catchers. Didn't happen. Mr. Albernaz is certainly a fan's ballplayer. He appears to be focused every minute of the game. He seems to handle pitchers extremely well. He has caught every star pitcher that has come up through the Rays system for the last several years. His work on behalf of the Rays was noted on his departure. He is off to the Detroit system on a minor league contract, reportedly because he has been offered an opportunity for more playing time. That means he may be coming back to the DBAP in a Mud Hens uniform. Or maybe not. To be perfectly honest, I could not be happier for the young man. We have often thought that the Rays simply were not giving him the opportunities he deserved and were continually puzzled by their unwillingness to put him behind the plate more often. Lastly, as we wrote back when in happened, he is responsible for one of our greatest thrills as a Durham Bulls fan. Let's look at it a again. Thanks, Craig! Good luck! 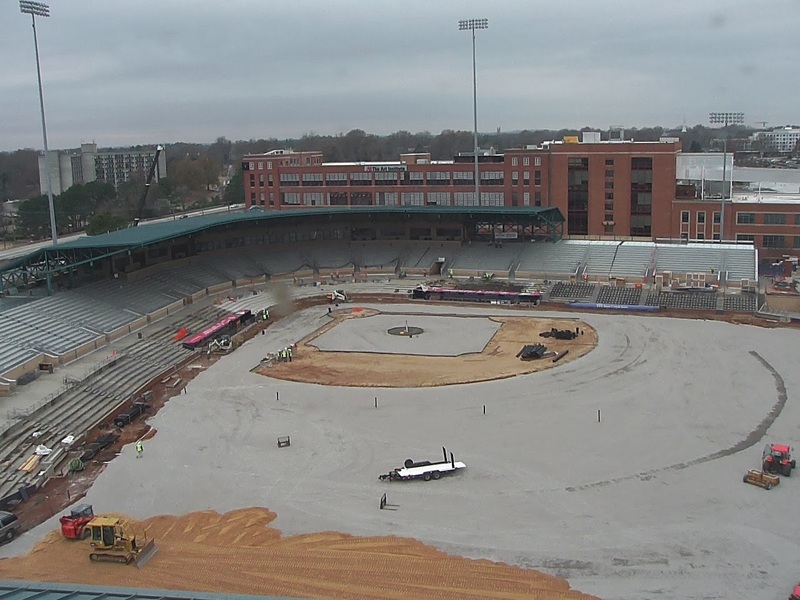 Looks like they've got the drains in place and more of the subsurface. 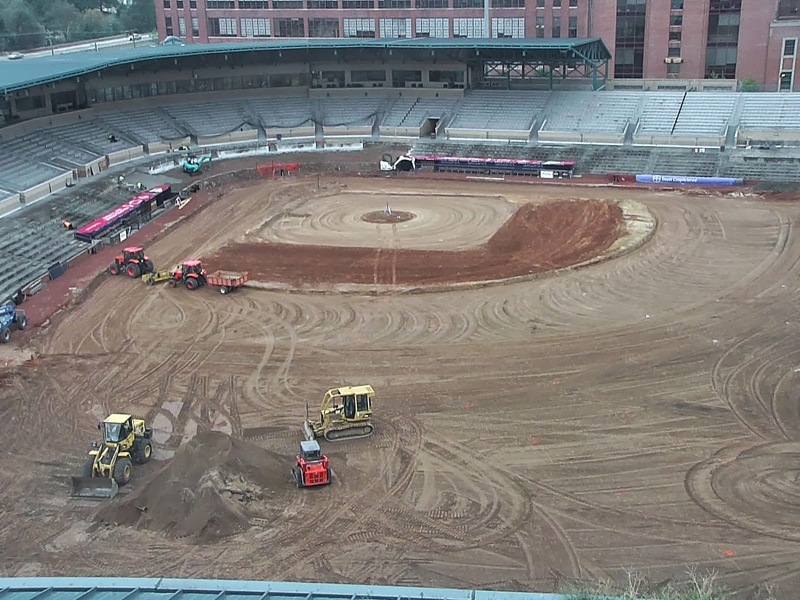 Bulldozers appear to be putting new dirt on top. Next is grass? This appears to be a photoshopped image of what the Blue Monster is going to look like next year. Story here. This is what it looks like today. 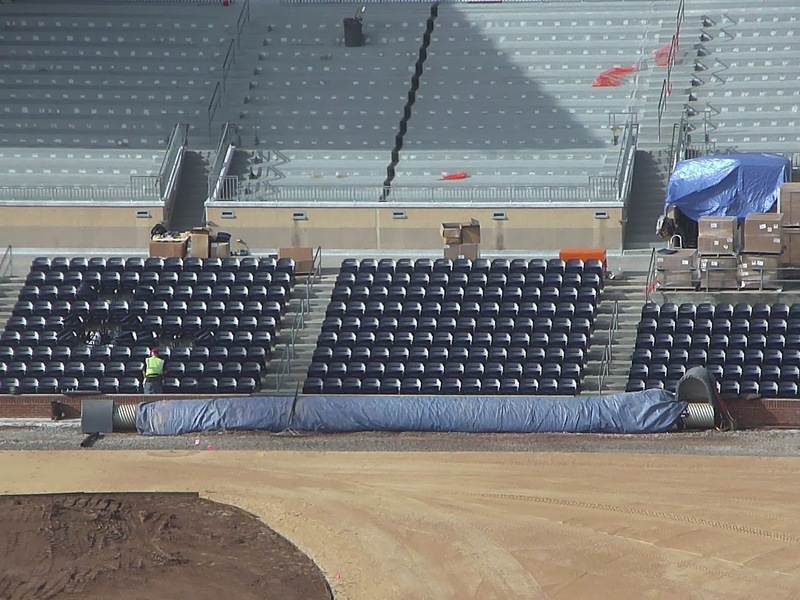 Note the corner where there used to be those shaky stairs going down from the top of the monster to the seating bowl. Wonder how that's going to work next year. 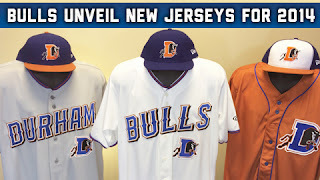 The Bulls recently announced that the team will be in new jerseys next year. I am not a fan of squiggly fonts. I find them hard to read and simply not very pretty. But that's just me. At least they left the "D" in the logo alone. Will have to wait and see regarding legibility of numbers at at a distance. Meanwhile, some of last year's Bulls are very likely to be coming back! And have a shot to make it up to the Rays. Vince Belnome, C.J. Riefenhauser, and Kirby Yates were added to the Rays 40-man. See commentary here, here, and here. Former Bull, and a guy WDBB really liked to watch back in 2007 and 2008, Jeff Niemann, has elected free agency. Niemann has spend a bunch of time on the DL the last couple of years. At 6’9’’ it was fun seeing all those moving parts when they arranged themselves to put a fastball across the plate. Comments here and here. I can't find the link just now, but I'm sure I read somewhere that Jason Bourgeois has done a deal with the Reds. For some young men professional baseball is a year-round endeavor. The last Bulls game was September 18. Less than a month later at least seven of them are playing baseball in Arizona, Venezuela, and the Dominican. As other leagues come online we may see some more back at work. A link that shows Rays system ball players is here. We mentioned earlier that two 2013 Bulls were playing in the Arizona Fall League, Mike Montgomery and Merrill Kelly. Vince Belnome’s first game for the Dominican League Estrellas de Oriente was on October 18. His teammate on the Estrellas, Adam Liberatore, pitched in his first game on October 19. Leslie Anderson has had a hot start with the Caribes de Anzoategui, in the Venezuelan League with an OPS of 1.056 in 17 AB. Jesus Flores is also playing in the Venezuelan League for the Navegantes de Magellanes. He was playing by Oct 11th. Juan Sandoval has had a couple of relief appearances with the Aguilas Cibaenas in the Dominican. That’s the team with the attractive godmother. 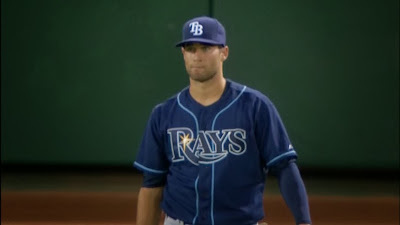 Robbie Knopf over at Rays Colored Glasses keeps an eye on the Rays playing in winter leagues. His Spanish is much better than mine (which is non-existent ... thank you Google Translate). 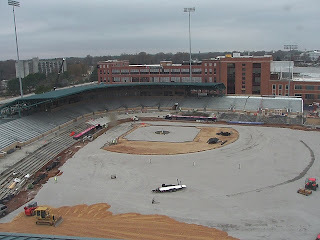 Most seasons we do a review of what we liked and what we thought were areas to work on for the DBAP and the Bulls in the season. We put out an invite for further comment and we usually get a few interesting observations. This year is different because of the renovations going on. To be honest, until the announcement was made I had not noticed that things were getting a bit shabby around the edges. After the announcement, however, we started looking more closely and realized that renovation would be a very good thing. On the other hand, until we see what happens (including cup holders for the front row of the terrace reserved seats!) we'll hold off on comments about facilities. The plans look good, though. National Anthem singers. When you listen to 60 or 70 performances a year you quickly come to appreciate effort that the Bulls invested in finding performers. We particularly like the choral groups. Also notable were a brass group whose name I missed and an a cappella group called Cognitive Resonance. Bull Durham racers. Fun to watch and creative in finding ways for Nuke to lose each race. Hope they come back next year. Food Truck events. The only down side of the food trucks was that it gave you a hint of what was possible down in the regular concession area. We hate to miss a moment of baseball, so we had to come very early. Being in right field, if the sun was out, it could be brutal for the vendors, I’d think. 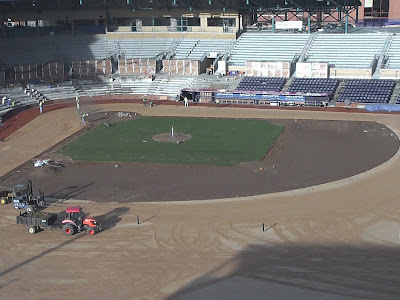 We appreciate the difficult balance that has to be made with contractors, etc., but it was a good idea worthy of a couple of repeats next year. I’m not big beer drinker, so I appreciated beer in small quantities being available (if not the price). Nice to taste all the varieties available. More always better, of course. 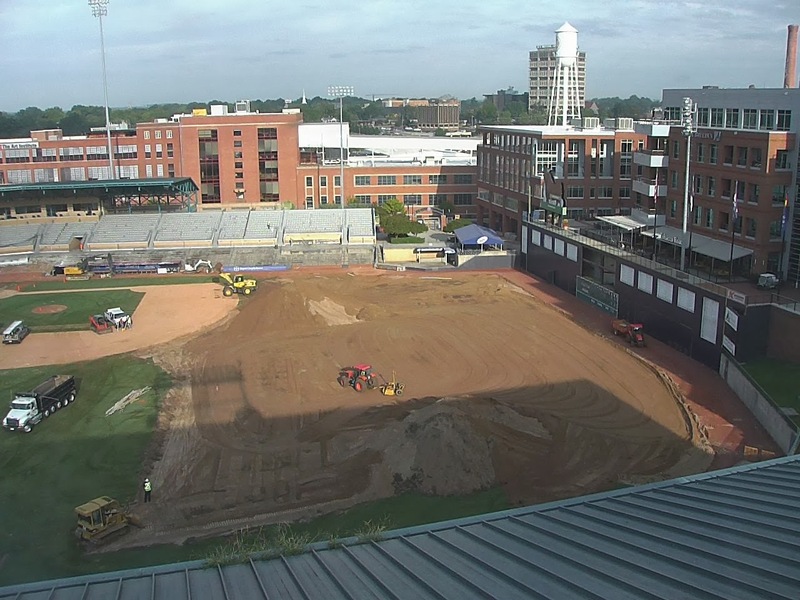 Bull City Summer was an interesting adjunct to the season. We are looking forward to the book when it becomes available. You can download a stencil to carve a Wool E. Bull pumkin. Buy a Governors’ Cup Champions T-shirt (got mine already). Take a look at the 2014 schedule (April 3! 166 days … a long, long time). Several 2013 Bulls have declared free agency: Ryan Roberts, Shelley Duncan, Jason Bourgeois and J.D. Martin. The last three made a difference this year. I'll miss them. Nothing precludes the Rays from re-signing, but usually doesn’t happen. Out in the Arizona Fall League Mike Montgomery and Merrill Kelly are at work for the Salt River Rafters along with several other Rays prospects we’ve never seen. Each year Watching Durham Bulls Baseball recognizes the hitter and pitcher who has spent the least amount of time in a Durham Bulls uniform. The award is named in honor of North Carolinian Archibald “Moonlight” Graham who famously played only two innings for the New York Giants in 1905, never coming to bat. We have just a few criteria for selection: Not considered are players who come through on a rehab assignment, played only in postseason, or (for the pitcher) a position player thrown to the wolves at the end of a losing game. This year we cannot find a position player that really embodies the spirit of the award. Not counting rehabbing Ray Luke Scott, the player with the least amount of playing time was the unfortunate Hak-Ju Lee. Lee, however, did play in 15 games and had 57 plate appearances in his time as a Bull before his injury. So this year we simply won’t make an award for a position player. On May 17, 2013 at Frontier Field in Rochester New York, Austin Hubbard came on in relief to begin the 6th inning. The Bulls were behind 5-0 after a disastrous 2nd inning. Hubbard had been called up from the Charlotte Stone Crabs where he’d been doing OK and it was understood that he was just filling in while the Rays sorted out their own bullpen. He did not have a good day: ⅔ inning, 5 runs on 4 hits and 3 walks before leaving in favor of Adam Liberatore and, in the 9th, catcher Craig Albernaz. After that game Hubbard went to Montgomery where he made 28 more appearances in relief for the Biscuits. Stats. 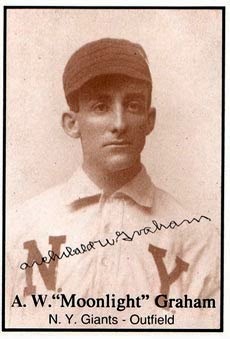 Archibald “Moonlight” Graham achieved lasting fame as a character in the W.P. Kinsella novel, Shoeless Joe, and then became even more famous when he was played by Burt Lancaster (and Frank Whaley) in the Kevin Costner film, Field of Dreams. As a ballplayer in 1905 he played two innings in the major leagues as a right fielder for the New York Giants. He never came to bat. You can look it up. He did, however, go on to a career as a well-loved physician in Chisholm, Minnesota. Of interest to us is that he was a North Carolina native (born in Fayetteville, grew up in Charlotte); graduated from UNC (where he played baseball); and was the older brother to UNC President and US Senator Frank Porter Graham. If you find him an intriguing character, his Wikipedia article is a good start. There’s a nice NBC piece done on him a few years ago. And then there’s a terrific book by Fayetteville writer (and Bulls fan) Brett Friedlander and Robert Reisling, Chasing Moonlight. Copies of the book are in the Wake and Durham County Library systems, and I found my copy at Quail Ridge Books in Raleigh. Fairly simple, if a bit deceptive, arithmetic going on here. Eight teams are in the playoffs. They can have twenty-five players, thus 200 in playoffs. 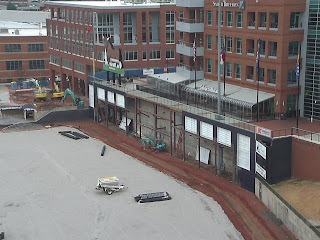 If we look at those rosters, we find 25 have worn a Durham Bulls uniform. Ergo: 12½% were Bulls. Sixteen are with the Tampa Bay Rays. No surprise there, although one, Sam Fuld, was only in Durham for a very brief rehab stint. The others we saw more of at various times: Chris Archer, Alex Cobb, Jeremy Hellickson, Jake McGee, Matt Moore, David Price, Alex Torres, Jose Lobaton, Evan Longoria, Ben Zobrist, Matt Joyce, Sean Rodriguez, Delmon Young, Wil Myers, and Desmond Jennings. Elliot Johnson and B.J. Upton with the Atlanta Braves. Grant Balfour and Stephen Vogt with the Oakland A’s. J.P. Howell and Carl Crawford with the LA Dodgers. Randy Choate with the St. Louis Cardinals. Seems the Bulls front office could turn this into a marketing gimmick somehow. You really are seeing future stars when you come to a Bulls game. Note: Thanks to a regular reader for help in remembering a couple of these guys (Benoit and Choate). Did I miss anyone else? This continues our look at the Durham Bulls pitchers for 2013. They are discussed in the innings-pitched sequence shown in the table in Part 1. Charts in this post exclude a couple of pitchers who will be discussed when we get to them: Craig Albernaz, Matt Moore, Austin Hubbard, and Braulio Lara. Steve Geltz (RHRP) came to the Bulls out of the Angels system and made his first appearance with the team on April 6 (and got one of his 5 wins). He had the most innings of any of the relief corps (67) and appeared in 41 games. He was arguably the best of the relievers (not counting the closer crew of Lueke and Yates, but even there Geltz had 3 saves). Middle relievers are notoriously hard to evaluate. But Geltz has two stats that jump out at you. His Walks and Hits Per Inning Pitched (WHIP) was an impressive 0.85, the best on the team among the regular pitchers, and his ERA was 2.82. The majority of games he appeared in the Bulls won (26 out of 41). The mystery will be, of course, if he can get a contract and an invitation to spring training next year. He should. Stats. Kirby Yates (RHRP) had a great year, as we’ve discussed a few times. If he seemed a bit tired near the end, he did pick up four (!) saves in postseason play. Stunning WHIP, ERA, and FIP numbers over his 61⅔ innings and 51 appearances. Fortunately for the Bulls, if not for him, he was not on the 40-man, so he was with the Bulls all year. Next year? The Bulls can hope. The Rays may be coming up on a decision time for him. Stats. Adam Liberatore (LHRP) was in a lot of games (43) for quite a few innings (60) mostly in short relief and occasionally in a left-on-left situation. Most years we have not seen the Bulls play matchup very often, but this year when there were sometimes four lefties available (Liberatore, Beliveau, De Los Santos, and Riefenhauser) we saw more matchup appearances. His numbers are sort of middle of the pack for the 2013 Bulls, which means they are pretty good. A particularly low FIP of 2.42 means that the coaches are likely to be talking about what else he’s got. He could make it to the 40-man or be part of a trade package in the off-season. Stats. Josh Lueke (RHRP) did a terrific job for the Bulls all year, making him and Kirby Yates an almost unbeatable team at the end of a game. His 17 saves matched up with Yates’ 20. Lueke got called up 4 times during the year. He appeared in 19 games for the Rays with an ERA of 5.06 and a WHIP of 1.64, nothing approaching his numbers for the Bulls. On the other hand, it doesn’t look like the Rays were using him in save situations. A very deliberate presence on the mound, he could be irritating if you were ready to go home, but going home with a win was worth it. Not on first round post-season roster for Rays. Stats. 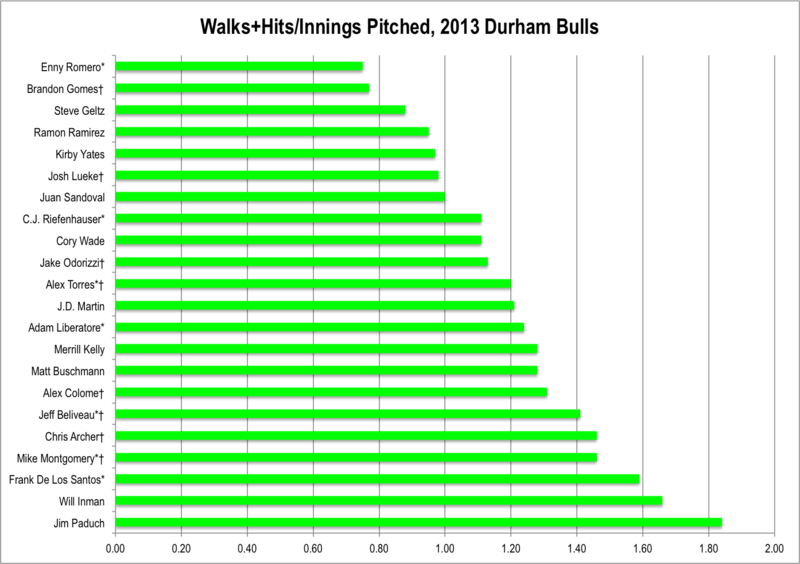 Chris Archer (RHSP) started the season with the Durham Bulls and pitched in 10 games, not particularly successfully. But he was very likely working on specific pitches and waiting for his opportunity with the Rays. When that came in late May, he was off and not looking back. As a Ray he’s accumulated a very respectable (great!) 9-7 record, ERA 3.22 over 23 starts. He is on the Rays’ post-season roster and will be starting one of the early games of the ALDS. We won’t see him back in Durham except as a visitor. Stats. Cory Wade (RHRP) was a Bull back in 2011 and we were pleased to see the Bulls pick him up during the confusion of mid-May. We also thought he’d be working hard to get back on a major league team. He did just fine, including several crucial spot starts. His ERA of 2.17 over 30 games and 50 innings was superb, the third best among the regulars. When it apparently became clear to him in late August that he was not going to get added to the Rays’ 40-man, he was released. 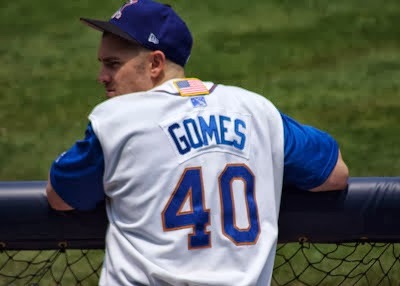 He finishied out the season with the New York Mets Triple-A team, the Las Vegas 51s. Maybe he will make it back as a Met next year. Stats. Alex Torres (LHSP/RP) has been with the Bulls for parts of three seasons. We have been quite critical of the young man, especially as he struggled through last season with an ERA of 7.30 over 26 games and 69 innings. Rumor at the beginning of 2013 was that he had worked something out over the winter. That was surely the way it looked in his 9 games he started with the Bulls this spring. His ERA wasn’t great, but his WHIP was, for Torres, an exceptional 1.20. Other metrics looked just fine. The Rays, however, had an eye on him as a left-handed reliever. He went up in mid-May, came back for two games, and went back up after a late May game. With the Rays he’s appeared in 39 games, all in relief. He has had an extraordinary WHIP of 0.90 and an equally exceptional ERA of 1.71. He is on the post-season roster and unlikely to be back in a Bulls uniform any time soon. He is a great example of how fans can almost never really get a grip on a ballplayer’s potential. Folks in the Rays system did not give up on Torres and he has paid them back. Stats. Jeff Beliveau (LHRP) joined the Bulls a couple of weeks into the season. From the stands we always perceived him as a left-handed reliever-in-waiting and he made numerous trips to the Rays during the season. But he did not get into a game until September, after the Bulls season was over. Used almost exclusively in short relief, at the end of the season we realized, much like Steve Geltz, that he was one the the guys who really made a difference this year. Some of his metrics are on the high end, but he was a pretty reliable guy. Unless he gets involved in some trading activity, we’d guess he’ll be back with Durham next year. Fine with us if he is. Stats. Jim Paduch (RHSP/RP) didn’t have all that good a year with the Bulls in 2012, but who did? So we weren’t too worried about him coming back this year. He won his first game pitching in relief of Mike Montgomery, but things really did not look all that good in his next several games. His best game was at the end of May, but by then it was too late. He was offered at job in Montgomery, but decided to retire instead. Always seemed like a nice guy to me, and he had a terrific backstory of getting up to AAA by way of several seasons in independent ball. But it wasn’t working out. Good luck, Jim. Stats. Will Inman had a decent enough 2012 with the Pawtucket Red Sox, so he seemed a reasonable choice to help fill out the Bulls bullpen this year. But he wasn’t very impressive from the start and, while he didn’t have any truly disastrous innings, over time the bad news seemed to accumulate. By June his ERA was up to 6.47. He left the game with an injury on June 3, pitched in three more after coming off the DL, and was released in late June. Stats. Frank De Los Santos (LHRP) is a pitcher who seems to have been around a very long time. But he actually hasn’t. He is only 25 years old. He just can’t seem to stay healthy. This year was no exception. He did appear in 26 games, but for just 32 innings. There were a couple of moments in 2012 where he looked very, very good. But we did not see any of that in this year's games. He appeared in 11 games, went on the DL, came back in early July and appeared in 15 more games. He was traded to the Chicago White Sox at season’s end. If he’d ever been truly healthy my guess is that he could have been something special. Stats. Juan Sandoval (RHRP) spent most of his year with the Montgomery Biscuits (46 games/58 innings). But he sure was handy when he visited the Bulls. The first time was a stretch from late May to late June (11 games/19 innings) when he posted some good numbers and only got in trouble once. Then he came back at the end of the season for a desperately needed spot start in a end-of-season double header. In the Bulls’ post-season he was perfect over 4⅓ innings. At 32, Sandoval is famously coming back from serious injury and a lot of time in the Mexican League. Can he stick at AAA? Maybe we will find out next year. Stats. C.J. Riefenhauser (LHRP) came up from Montgomery at the beginning of July and yet only appeared in 17 games and just 21 innings. He did OK, but each year of his professional career he’s been pitching fewer and fewer innings (2011 - 138, 2012 - 114, 2013 - 73). That leads to concerns about his fundamental strength and durability. He had one of the better WHIP (1.06) of the Bulls and if his time in Montgomery is included it was superb (0.83). Maybe it’s just a matter of opportunity. We’ll have to see next year. Stats. Brandon Gomes (RHRP) spent a couple of weeks with the Bulls in August as he was working his way back to the Rays. Probably more time than he really needed, but the Rays were manipulating their roster at the time and Gomes had options left. He was very helpful as he pitched 10⅓ innings over 9 games with a WHIP of just 0.77. Stats. Enny Romero (LHSP) was in only one regular season game for the Bulls, but that was a brilliant 8-inning shutout of the Norfolk Tides the last game of the year. He went on to pitch 2 innings in relief in the playoffs and after the AAA season’s end got called up to the Rays for one game start against Baltimore where he got a win. He had an excellent year in Montgomery, so we can expect him to start 2014 as a top Rays prospect, possibly with the Bulls. He is now on the Rays’ 40-man, although he was not at the end of the Bulls’ season. Stats. Ramon Ramirez (RHRP) was hired by the Rays in mid-July in what has to be described as a speculative flyer. 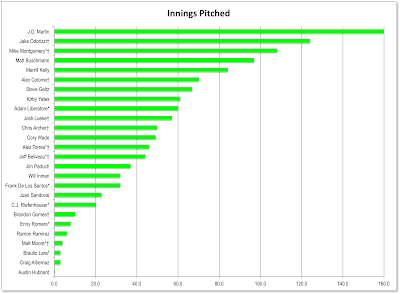 At the time, however, there were a lot of Rays pitchers with injury problems. Ramirez appeared in just 6 games for the Bulls and pitched only 6 innings before being released at the end of the month. Stats. Matt Moore (LHSP) had a one-game, 4-inning rehab appearance on August 29. Didn’t do all that great, but the Bulls won the game against the Braves 7-6. Adam Liberatore got the win. Box. Craig Albernaz is a catcher, not a pitcher, but he did have three appearances on the mound this year and pitched three scoreless innings, allowing only one hit and recording 2 strikeouts. Not one walk. Well done! Braulio Lara (LHRP) came up from Montgomery at the very end of the season and pitched 3 innings in relief of Juan Sandoval, who had come up to pitch in that same game. He had a busy 45 game, 72 inning year in Montgomery, but did not have all that strong a set of numbers (ERA 4.38, WHIP 1.54). Stats. Austin Hubbard (RHRP) came up from Single A Charlotte for just one game in mid-May when the Bulls were on the road in Rochester. The Red Wings scored 5 runs off of him in just ⅔ of an inning (they had earlier scored 5 runs in one inning off of Jim Paduch). He then went off to Montgomery where he had 31 more not particularly good innings on the year. The relentless arithmetic of baseball stats left him with the highest ERA of any Bull this year (67.5) and the lowest number of innings pitched (⅔). No surprise if you think about it. Stats. 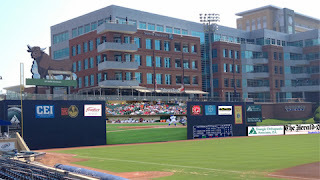 Twenty-six ballplayers pitched for the Durham Bulls in 2013. They ranged from stalwarts like J.D. Martin who appeared in 27 games and pitched 160⅓ innings or Kirby Yates who was in 51 games for 61⅔ innings, to young Austin Hubbard who pitched just ⅔ of an inning. 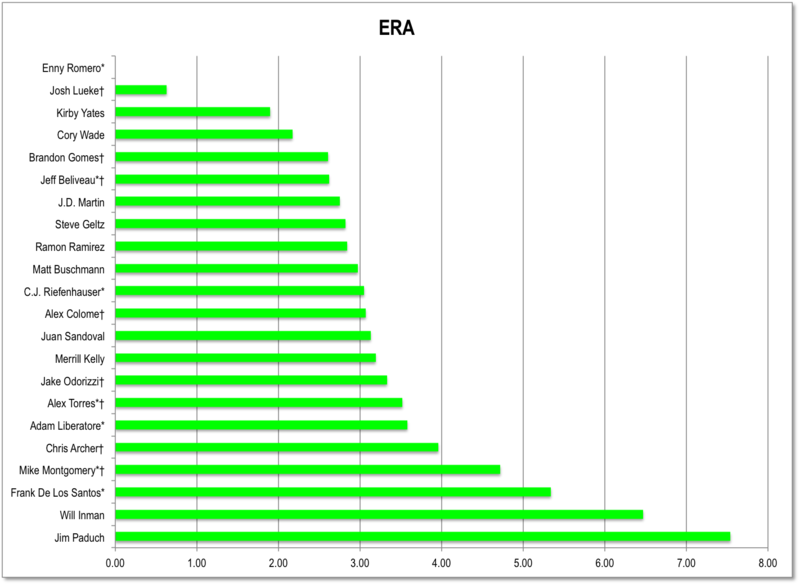 The number of pitchers in a given year is highly variable at any level of baseball and this years seemed about normal. 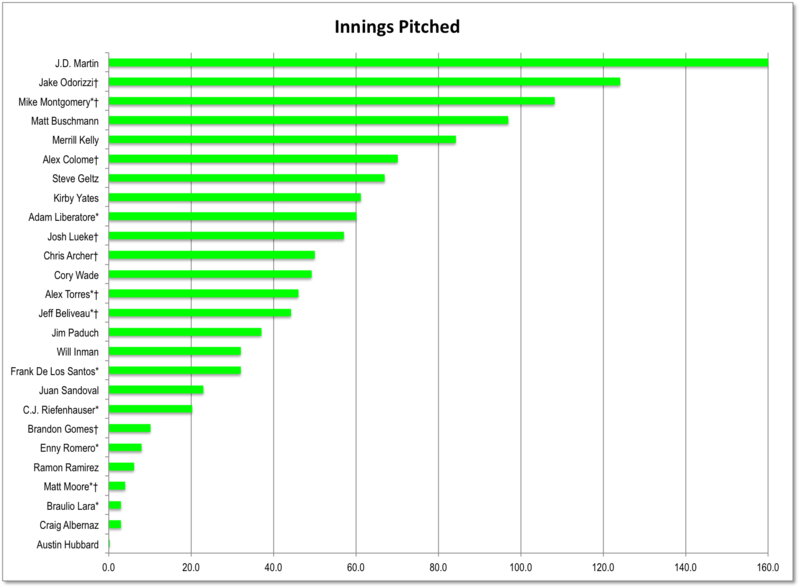 The Bulls had 25 pitchers in 2012, 33 in 2011, 25 in 2010, 34 in 2009, and 27 in 2008. Some of those pitchers were position players brought in to finish a out-of-reach games and some were rehabbing major leaguers just passing through on their way back to the big leagues. The table is sorted by innings pitched. Left-handed pitchers are marked with an asterisk (*). Players on the Tampa Bay Rays 40-man roster are marked with a dagger (†). We’ve only picked out a few key stats for the table. For more details, check out the Baseball Reference or Fangraphs pages. The chart at the end of the post pulls out just the innings pitched. The starting rotation for the Bulls as 2013 began was Chris Archer, Alex Colome, Mike Montgomery, Jake Odorizzi, and Alexander Torres. Mike Montgomery went on the DL after his first 3⅔ inning appearance and J.D. Martin was moved into the rotation. J.D. Martin (RHSP), as has been often stated here, was the leader of the starting pitching staff this year. His numbers are simply superb, but, as important, he was available every fifth day all year long, something that could not be said for any other starting pitcher on the team. That sort of stability is key to a team at any level, but possibly even more so at Triple-A ball. He won all sorts of awards this year, and deserved every one of them. He got a September call up for one day and accepted assignment back to the Bulls a day later. He is, or will become, a free agent, so it’s anyone’s guess on whether he sticks with the Rays system next year. He’s WDBB’s pitcher of the year. Stats. Jake Odorizzi (RHSP) is likely one of the upcoming stars for the Tampa Bay Rays. In addition to being the Bulls’ #2 starter, he appeared in 7 games with the Rays (29⅔ innings). His numbers are not spectacular, but they are certainly more than enough to make him look good for the future with the Rays. He was a September callup and it remains to be seen if he will be on the post-season roster(s). Stats. Mike Montgomery (LHSP) was an instance of the Bulls being a place where a prospect works on his game — sometimes without a lot of success. Montgomery put in a lot of innings, but on a per game basis he rarely went long. He only pitched in one game before going on the DL early in the season. After his return in late May he made his turn in the rotation, but was rarely effective. Teams do not give up on left-handers with promise. He will probably be back next year and maybe deliver then. Stats. Matt Buschmann (RHSP) is a surprising guy in a couple of ways. At 29 you’d think he’d be further along in his career path, but for now he was very, very good with the Biscuits and the Bulls this year. He came over to the Bulls at the end of May after the Rays had called up Archer and Torres, and Montgomery went on the DL, He is exactly the kind of guy WDBB likes. He carried the second best ERA among the regular starters. Looking back, we wish we’d written more about him. Terrific numbers. Kept the Bulls in the game. Won a bunch of games. Here’s hoping he’s back next year. Stats. Merrill Kelly (RHSP) came over from AA Montgomery and pitched his first game on June 14. I’m looking forward to seeing how this young pitcher develops. He was the 5th man in a very solid end-season rotation. Fun to watch. Stats. Alex Colome (RHSP) did not have a good year, and I was surprised to see how many innings he pitched (70⅓). Early on he did have a great run of three games (5/13, 5/18, and 5/24). He was called up to the Rays and started and won a game on May 30. He came back to the Bulls after that and appeared in 4 games before going back to Rays to appear in (and lose) two games. He came back to Durham not long after that, but was placed on the 60-day Disabled List in late June/early July before going back in the lineup. In tried and true Rays tradition, we have not heard a word since. Stats. 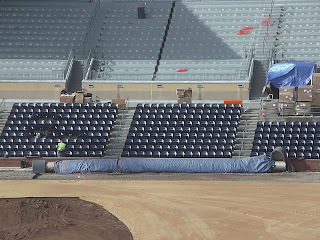 Seats are gone. 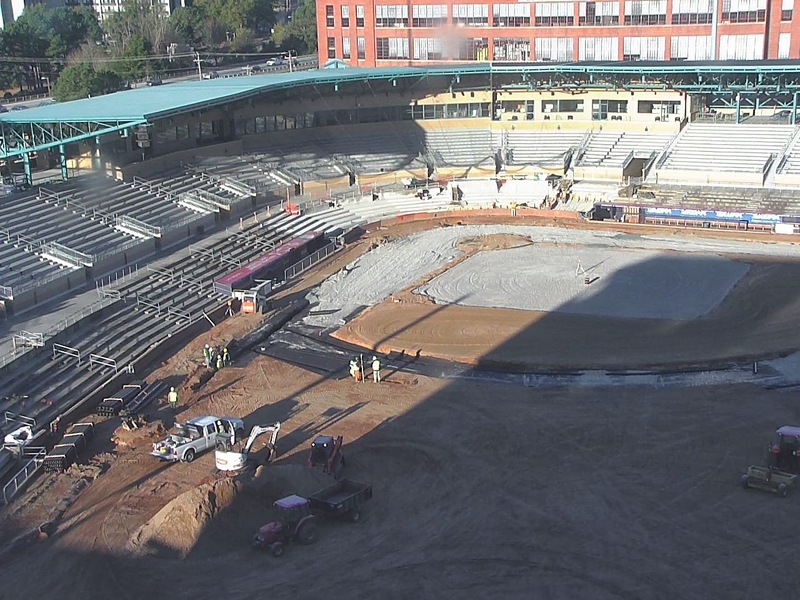 Dirt's going. 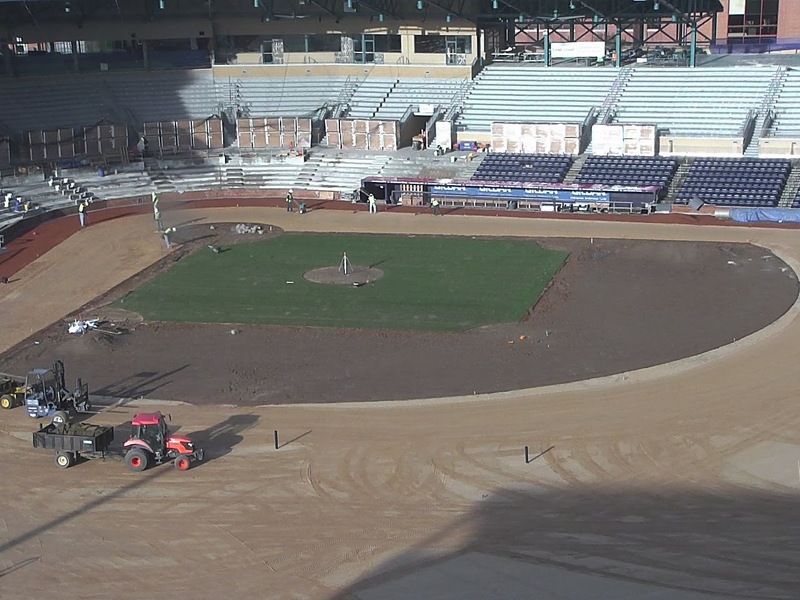 Stadium Cam. The Rays and the Rangers played a tie-breaker last night and the Rays won 5-2. That puts an end to an exciting couple of weeks and sets the stage for Wednesday’s beginning of the post-season with the Rays at Indians. Both teams had a good month. Both teams will be adjusting their rosters. Should be a fun game to watch, even though we really don’t like the idea of single game playoffs. 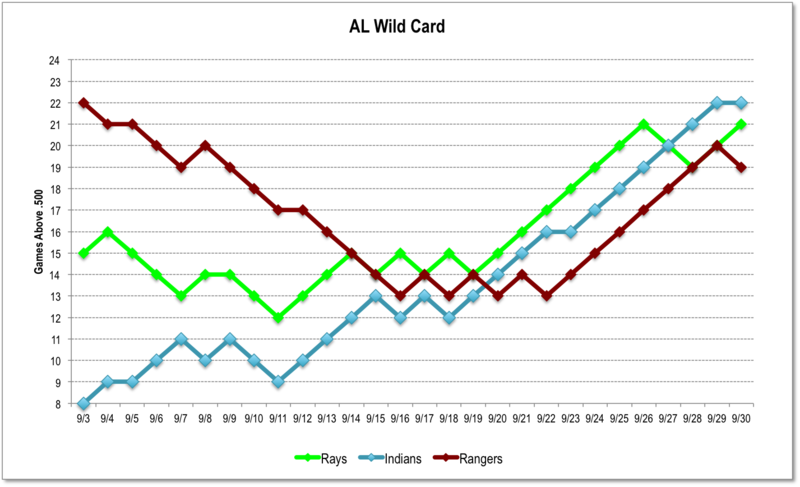 But the run for the Wild Card is over and here’s the last 2013 American League Wild Chart chart. Bottom of the 9th, Rays ahead of the Rangers 5-2. The Rays’ Sam Fuld had come in to play center field in place of Desmond Jennings a bit earlier. Fuld had just scored that 5th run with some aggressive baserunning in the top of the 9th. With no dramatic music at all we get a camera shot of Kevin Kiermaier out in center field and see that Fuld in now in right field. So it’s Kiermaier for Wil Myers. Kiermaier to center, Fuld to right, and our guy is in the game. Smart (in our opinion) move. Help out on defense on the year’s crucial game. Win this one and go into the post-season. This is a Moonlight Graham moment and Kiermaier’s official stat page is spookily similar to one from 1905 for North Carolina's Archibald Graham. That’s going to change, of course, but for now we could not be happier for the young man who helped the Bulls into the Governors’ Cup. Over in Montgomery, where he accumulated a bunch of awards this year, they are happy too. Box score. Ordinarily at this point we’d provide a link to the Tampa Bay Times (née the St. Petersburg Times), but we won’t be doing that any more. They have just taken their Rays’ coverage behind a paywall and we don’t think we should link to for-pay coverage. I have no idea how creative the Rays' had to be with their roster to get Kiermaier into the game. At a guess, they probably gave up on a rehabber and put him on the DL. But now I think that the Rays’ have to go back to a 25-man roster. My guess is that Kiermaier might not stay with the team. We’ll see. But by coming in the game yesterday it means that he’s on the Rays’ 40-man and that could last all the way into 2014 for him. Great! Update: Pre-game comments from Kiermaier after his call-up. Players in this version of the 2013 hitters’ table are sorted by wOBA. See previous post for the table sorted by games played. The less familiar stats such as weighted on-base average (wOBA) and weighted runs above average (wRAA) are explained at the links. Players with an asterisk are left-handed batters. Data sources are Baseball Reference.com and Fangraphs. Players discussed in order of games played. Jason Bourgeois, besides having the most difficult name to spell correctly, added quite a bit to the team this year and not all of it shows in the stats. First of all, at the beginning of the year he was a speedy outfielder who, along with Rich Thompson, could cover left and center and steal bases (22 on the year). This base running speed made up for Durham’s lack of power throughout the year. He and Thompson helped limit the damage from Wil Myers’ surprising lack of skill in right field in the early part of the season. He got to play in 9 games with the Rays late in the season, but there was no public bid for his services as he passed through waivers on his way back. At 31, he needed perhaps a bit more to earn a call back for 2014. We’ll have to wait and see. Stats. Shelley Duncan may have had his last hurrah as a baseball player with the Bulls this year. To be honest, we like just about everything about what we have seen from him over the years. But he seems to have lost a step and certainly was not the power hitter this year that he has been in the past. With over 300 major league games under his belt, he surely brought a depth of experience to the clubhouse and his enthusiasm with each win was visible. To get some insights into his approach to the game, take a look at two very fine articles (here and here) from this year’s Bull City Summer. 54 RBI is nothing to sneeze at. The Bulls needed every one they could get this year. At 33 is there a chance that he could be back? Maybe. Stats. Wil Myers spent the early part of the season with the Bulls, playing in 64 games before moving on. (Note: that was more than Longoria's 38 games in late 2007/early 2008.) We won’t see him in the DBAP in a Bulls uniform again (unless it’s for a rehab assignment and we’d rather not see that happen). We admit that his first month or so was unimpressive when compared to the hype, but then we noticed his RBI numbers, which were substantial even early in the season, much less what he accumulated over his 64 games (57). 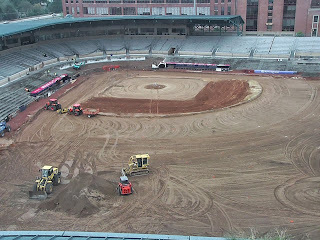 Early awkwardness in right field smoothed out a bit, but needed work. At the plate he eventually showed all that was promised, hitting one of the longest home runs we’ve ever witnessed and 13 more to go with it. Note that even though he left the team in June, at the end of the season his 14 homers were tied for the team lead (with Anderson). We wish him well. We’ll be able to say we saw him way back when someday. Stats. Jesus Flores ended up being the Bulls go-to catcher for much of the season. I think it’s fair to say that he would not have gotten quite as much playing time if the Bulls had not needed Gimenez in the outfield. Not much of a bat, but clearly an above average defensive catcher. And that’s what the Bulls needed after Myers departed and Thompson got hurt. Flores has 311 major league games, more than Duncan. So he was yet another veteran in the clubhouse, in his case working with several young pitchers. Honestly, I never paid much attention to him over the year. Maybe I should have. He might be at the bottom of the power heap, but he might be back even with that awful wRAA. Stats. Rich Thompson had some seriously bad luck this year. First of all he started the season in a slump and then, just as he was coming out of it, he broke his foot and was out for the rest of the year. He was noticed in the stands of the Triple-A championship game and it sure sounded like he is on the verge of retiring. Too bad. One of the keys to the 2013 Bulls was speed. The Bulls stole 137 bases this year, up from just 74 in 2012. Of those 74 in 2012, Rich Thompson accounted for 29 of them. By the time of his injury on June 6, Thompson had picked up 22, and that with a not-very-good OBP of just .325 (not very good for Thompson, that is). At 34, we’ve got to guess that he won’t be back. Too bad. Stats. Evan Frey was part of the scramble to find an outfielder in June and July. To that end he was helpful. At the plate, not so much. But he did his job. He also spent some time in Montgomery and came back to lend a hand at the end of the season. He’ll need to offer more promise at the plate if he’s to return. Stats. Kevin Kiermaier was a welcome addition to the Bulls' roster near the end of the season. Needing a center fielder ever since Rich Thompson’s injury, 23 year-old Kiermaier joined the Bulls in late July and clearly had a good time. He’s a fun-to-watch fielder and quick on the base paths (7 stolen bases, 6 triples). He had a terrific combined season at AA and AAA. The best part for Bulls fans is that he is a solid candidate for a full year with the Bulls in 2014. That should be fun. Stats. Ryan Roberts simply wasn’t much help to the Bulls even though he got a good bit of playing time in his many stays with the team. It’s fair to say, I think, that he came into 2013 assuming he had a shot at being a Rays’ regular, and he did play in 60 games with the Rays this year. But when the Rays needed to move Wil Myers up, it was Roberts who got optioned down. He bounced back up a few days later, hit two home runs, and was optioned back (all this in late June, early July). He then went back up to the Rays for late July/early August, but came back, this time in DFA circumstances, meaning he was off the Rays’ 40-man roster. Roberts had the most major league playing time of any Bull, 510 games over 8 years, but he simply didn’t add much to the team that we could see. 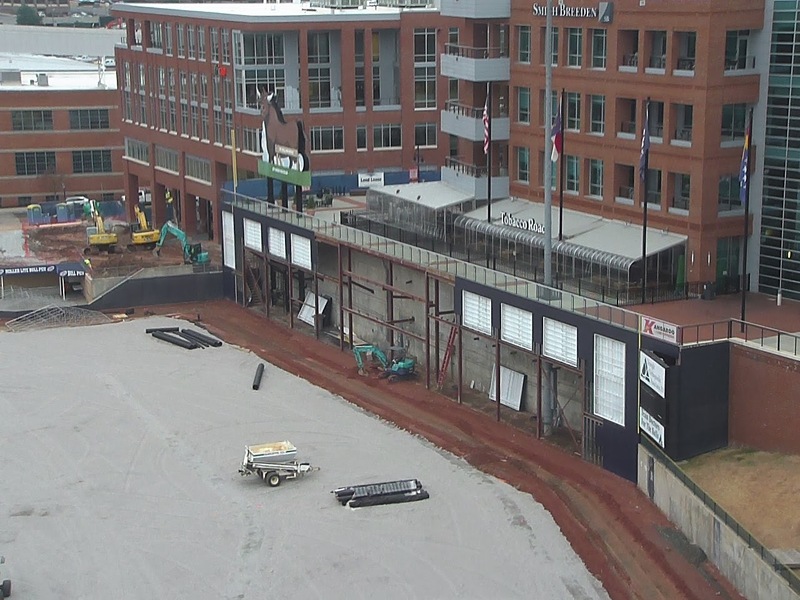 Quite likely the highest paid Durham Bull this year ($2.95 million). Did not play, as far as I could tell, in the Bulls’ post-season. Stats. Craig Albernaz remains one of our favorite ballplayers and he was responsible for our biggest single thrill of the season, his grand slam into the bull back on August 6 against the Rochester Red Wings. Hard to imagine, but catcher Albernaz has spent parts of 5 seasons with the Bulls, although this year was the only time he’s spent all of the season in a Bulls uniform. He is obviously a huge asset to the Rays system. Will he be back? Hard to say. My guess is that they will place him in the location in their system that they are most interested in developing pitchers. Note that he holds an ERA of 0.00 in his 3 games, 3 innings pitched in 2013, a significant improvement over his 2012 pitching performance. He’s reported to have been working on a cutter. Stats. Juan Apodaca did a decent enough job for the Bulls this year, so we were a bit surprised that he was released in mid-July. At a guess, he was a casualty of the Rays’ apparent confusion over just what to do at the catching position throughout their system. We have to note that not one of the four catchers with the Bulls this year made it into the black on the wRAA stat this year. The one with the highest rating was Apodaca and he got released. Certainly there are a lot of ways of looking at catchers that we fans aren’t going to be able to evaluate. Apodaca came to the Bulls out of independent ball, but we have not been able to find out if he caught on anywhere for the rest of 2013. Stats. Hak-Ju Lee was injured on April 20 ending what was a spectacular start to the season. The young Mr. Lee was simply doing it all: hitting, stealing bases, and playing a superb short stop. His advanced metrics were pretty (BB/K of 1.22). It would surely have been fun to watch him develop over the year. Because the Rays are being their usual selves and not informing anyone about his status, we can only guess that his surgery went well and that he is rehabbing right now. We can hope so, and we can hope that his recovery is successful enough for him to be with the Bulls next year. Stats. Luke Scott visited the Bulls on a rehab assignment at the end of the year. Stats.